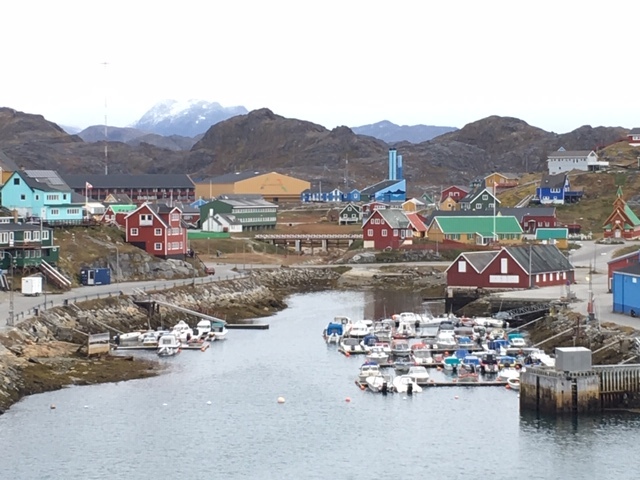 Paamiut means “at the mouth of,” referring to the location of this small town located at the mouth of the 30-mile long Kuannersooq fjord, or in Danish – Kvanefjord. Cruising in a fjord means that land is usually visible throughout the journey. 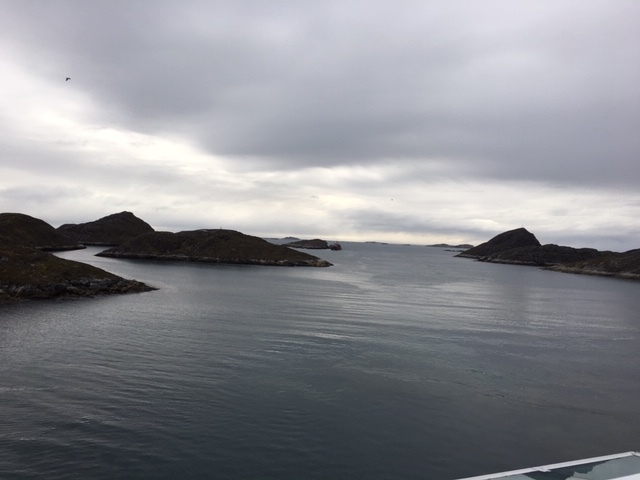 And being in a fjord also means that the water isn’t quite as rough as it can be on the open sea. This port had a pier that could handle Fram, so I was looking forward to coming alongside in Paamiut and not having to wait in line for my boat number to be called for tendering. We also heard that there was a possibility of kayaking in this port, but the wind was beginning to pick up and I, for one, wasn’t keen on kayaking today. As we approached the pier, the ship suddenly turned and then left the pier. The wind was predicted to increase and the captain decided that it was unsafe to dock as the wind would make it difficult to leave the pier if we had docked. So, off we went to find a spot to anchor so that we could safely tender. Talk of kayaking continued, but I felt little motivated to do this considering the increasing wind. Unlike other excursions, where passengers are brought to a kayak launching point from the ship, we did just the opposite. The kayaks are on board and travel with us. The Expedition Team does an advance research trip to figure out a good place for kayaking and for tendering into. Once they find a suitable place, they tow the kayaks to the appropriate place and the kayakers tender into that point, which is likely to be different than where the tenders drop off the other passengers in port. The church itself is a structure of significance in Paamiut. Built in 1909 in Danish style, the Church of Peace (Fredens Kirke) is of the stave style, entirely built of wood with posts and lintel construction. 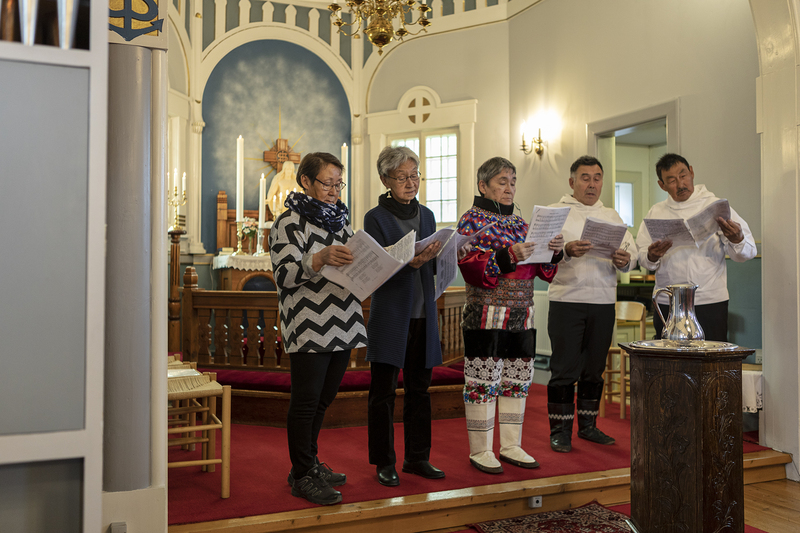 Many locals were out and about in Paamiut and the town itself seemed more lively than Maniitsoq. Several families with babies in strollers ambled the streets. 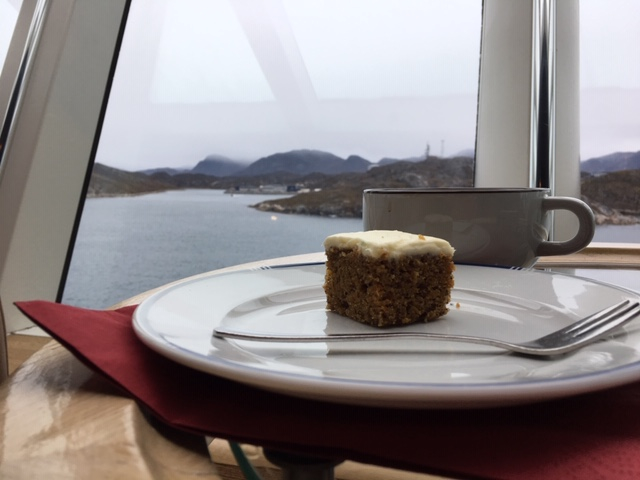 We had originally been scheduled to arrive in port at 2:00 p.m. with the concert occurring at 3:30 p.m. and the last onboard time at 5:30. There was very little time in port and I was disappointed that I missed the local museum, which closes at 3p.m. Guess that is something to save for next time. 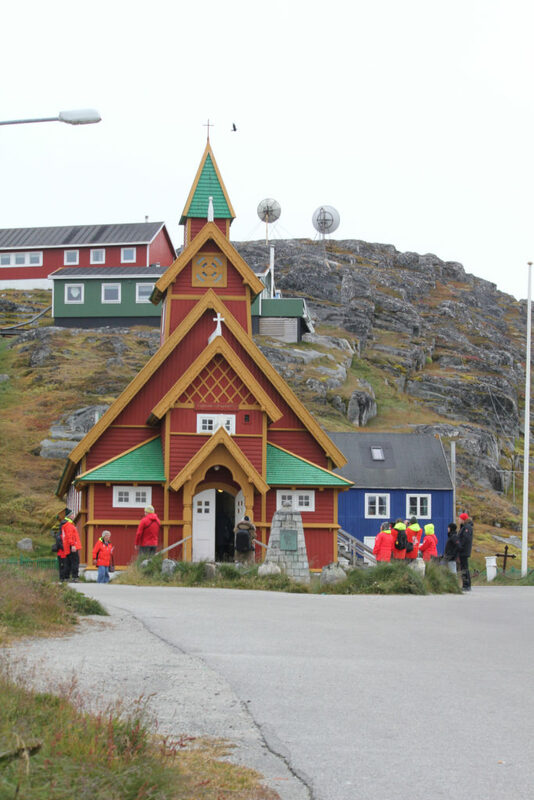 Like in Maniitsoq, the buildings in town were quite colorful, perhaps a way to make the long winters seem less dreary. Several groups of children played in the street. One group of three saw me with my camera and approached me wanting me to take their photo. 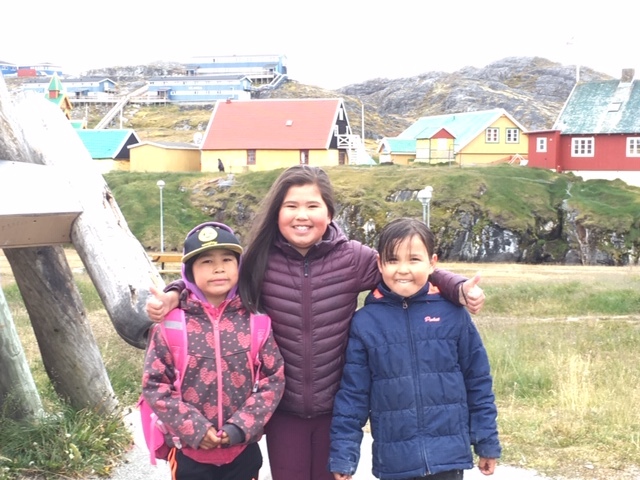 I speak nary a word of Greenlandic, but the older girl in the group knew some rudimentary English, so I obliged and took a few shots of these friendly children. I continued my walk around town, but feeling extremely tired and chilly, I headed back to the ship. One of the daily offerings is tea time. I just made it back to grab a cup of coffee with Bailey’s Irish Cream along with a piece of carrot cake. I grabbed a seat in front of the window on Deck 7, which is the entertainment area, observatory lounge, library, bar and event center. It’s nice to reflect on the day and the voyage so far. So far, so good. I haven’t broken any bones yet, something that concerned me. Medical facilities in these parts are few and far between and very basic if they exist. I took the precaution and purchased medical evacuation insurance from MedJet Assist prior to the trip. Fortunately, my health insurance would cover any medical issues, so I covered all of my bases. I have heard stories of med evac costs bankrupting families who couldn’t afford the medical transport costs. Throughout the trip, I remained vigilant and cautious about any situation that might cause me to trip, fall, slip or twist. This was another day that I escaped without an injury. Such a shame you never got to go kayaking but that church is so quaint, it looks so lovely.